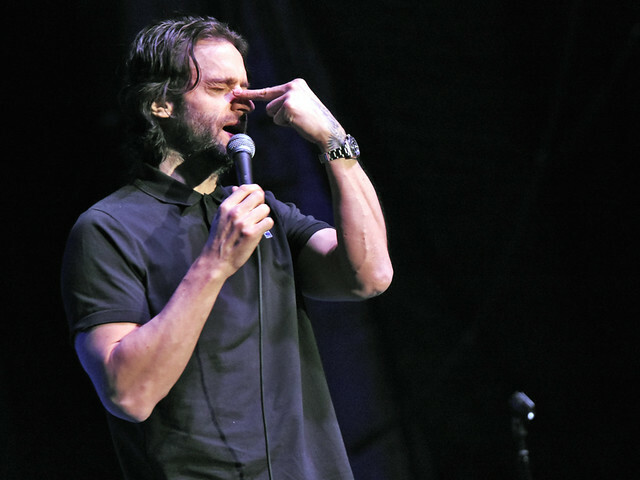 Chris D’Elia Sold Out Three Shows In One Night at The Paramount Reviewed by Diane Woodcheke on March 17, 2019 . 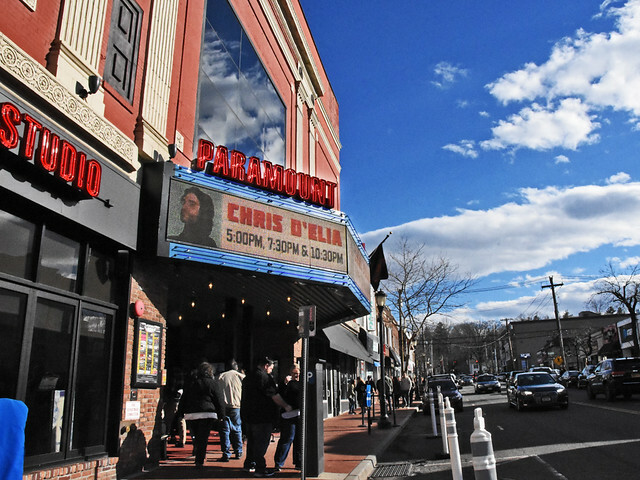 Chris D’Elia last visited The Paramount in Huntington, NY nearly two years ago on June 17, 2017. That night he performed two sold out shows. His fans were so excited about his return during the current Follow The Leader Tour that sales demanded three shows. D’Elia was determined to satisfy the fans. 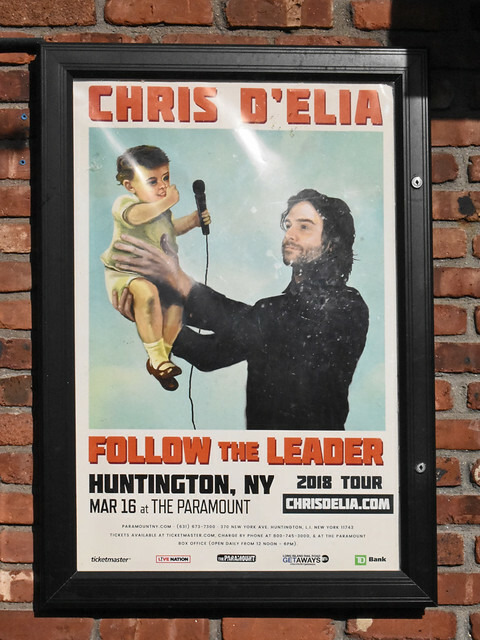 So on March 16th the main strip in Huntington not only hosted many Saint Patrick’s Day partygoers but thousands of D’Elia’s fans as they came and went for three consecutive shows. There was one at 5pm, another at 7:30pm and the last at 10:30pm, all with meet and greets schedules in between. It turned out it was a beautiful pre-spring day, although the calendar said that the first day of spring would not be till next week. The warm sun had fans showing up for the first show without the need for a winter coat. People of all ages filled the venue and they seemed to understand the need to be prompt knowing the schedule would be tight this evening and they were right. We were there to cover the first show of the night and it started promptly at 5pm. D’Elia brought with him a familiar face, Michael Lenoci, who warmed up the crowd with ease. 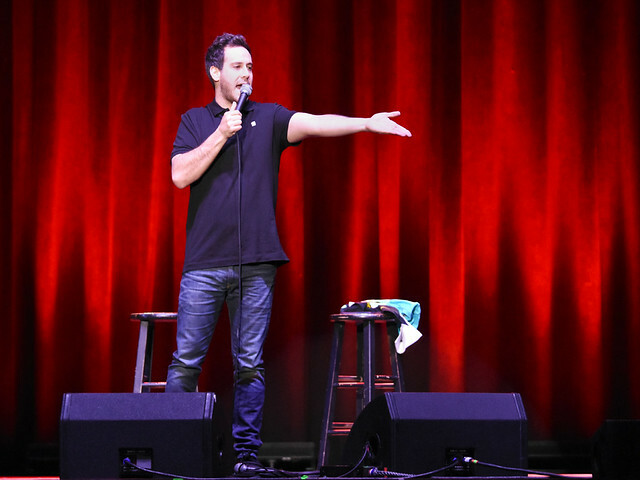 Lenoci is a regular opening act for D’Elia and in fact he was here at The Paramount with him in 2017 also. He performed for a solid fifteen minutes and had a completely different routine from the last time he was here. 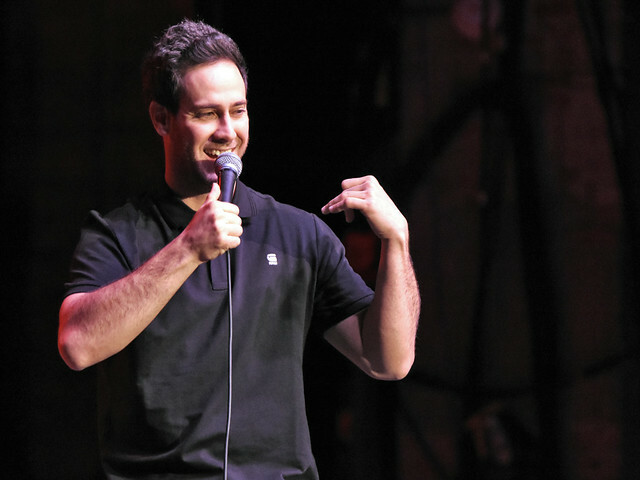 While a majority of his time was spent on the subject of relationships, be it a roommate, girlfriend or family member he had the audience laughing up a storm with several unexpected turns. When Lenoci’s time came to an end he would be the one to introduce D’Elia. As D’Elia came from the backstage, fans rose to their feet as he and Lenoci fist pumped each other when they passed. 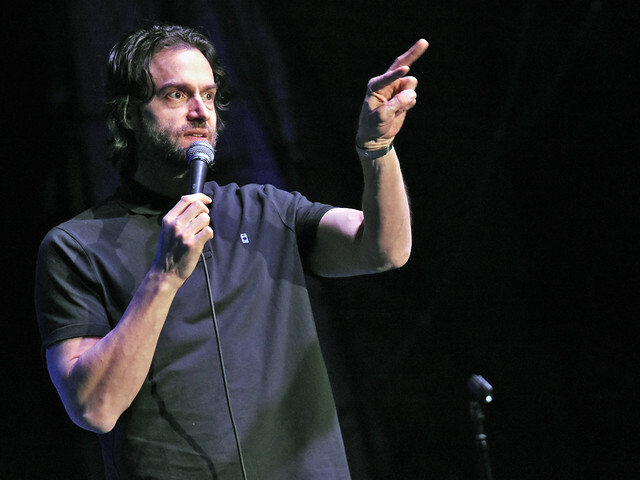 D’Elia wasted no time getting down to business and while he joked about it being so early and feeling weird about it still being light out his fans could easily tell he was happy to perform for them. Comfortably dressed, wearing a dark collared t-shirt, drawstring pants and a sharp pair of red and black high top sneakers, he freely moved about the stage. His performance is so fluid that you do not get the feeling that what he says is even scripted. 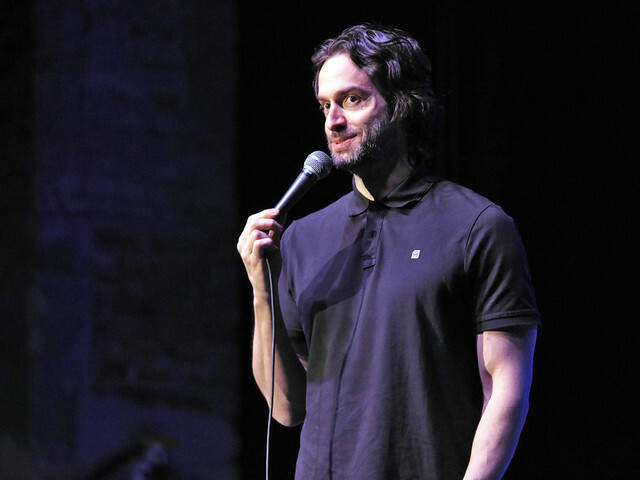 His fans were so in tune with D’Elia that there were many moments when the room would swell with laughter and cheering, sometime it was merely a look he would give the audience that would get them going. He shared something that perplexed him, “How can anyone get mad at what a comedian says? It’s a joke!” And with that in mind he said he would never apologize for anything he has said, now or in the past. After all it is his job to make people laugh and push the envelope everyday. He went on to talk about confidence and referenced how we all know someone with the utmost of confidence, our Grandfathers. You do not live that much life and do not show your confidence. He seamlessly poked fun at himself, shared his love for his two cute Yorkshire Terriers and his concern about living among dolphins, that in itself could have been its own show. He was beyond funny and had the crowd captivated the entire time. As the venue cleared out, fans were smiling ear to ear. Some of them shouted to the next group that were waiting online outside, “Get ready for some good laughter!” The tour continues throughout the United States and Canada through the end of May. Beyond that there are a few dates posted in July and August. If you do not see a show in your area soon, keep watch on his website for any upcoming opportunities to see him live and be sure to be ready to have a sore belly afterwards from laughing so hard. But until then be sure to catch him on two new Netflix releases, Comedians Of The World as himself and on You as the recurring character Henderson. And be sure to follow him on social media as he regularly posts something that will surely tickle your funny bone.